Well I'm approaching the second anniversary of this blog in a few days and I thought it would be cool to do a little recap and let all of you know what's coming up. When I started this website I had no clue what I was doing, well apart from fixing bikes of course. :) If I had, I would have done a few things differently, but i guess that's what life is for. After all, success is a lousy teacher. I must say however that I'm very happy with the way things are turning out. I've met a bunch of people on and off line, helped a few on the way, helped participate in the rebirth of more than a few bikes and had a great time doing it. 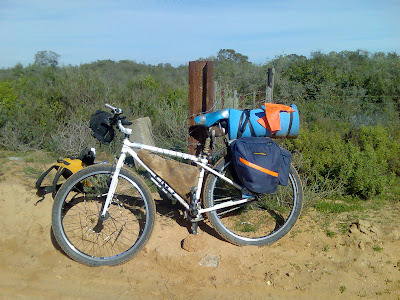 A big "thank you" to all of you, you've made this blog what it is and I think it is more than appropriate to adorn this post with the picture of a reader's bike. The one speed you see pictured is the pride and joy of Johann from South Africa and if you can believe it, he crossed a 100km desert with it. He's planning a 2300km cross country trip next year. Awesome ride Johann. I know that how to articles have been slow to come lately, but don't despair. I have one around the corner about replacing a rim the easy way stemming from my current Rat Bike Build Off project. Answering emails, comments on the blog and giving time at the local community bike shop has also kept me very busy. A recent email has also prompted me to start something I have been putting on hold for too long, a book. I was contacted by a publishing agent to write a book about bike repair. The deal never came to fruition and I decided to go about it myself. Wow, talk about a mine field when it comes to publishing a book! My day to day job is a cake walk compared to that. So in the spirit of Wikinomics and this blog, I've decided to publish it myself and make it available through here. No middle man, so I'll be able to offer it for donations. Just like Radiohead did with their new album, you'll be able to download it and give whatever you want. A hard copy will also be available through Cafepress for a decent price. The writing is all done(no copy and paste, all fresh text) and I'll use some of my vacation time coming up in the next weeks to take the pictures. That's it, I've just committed myself, so keep posted. Awesome! I'm very excited to see the book! I look forward to your book and will certainly compensate you for it. I've been reading your blog for over a year now, though I never comment. I've appreciated every post, whether bike-specific news or bike repair tips. Thank you for continuing to post to this blog. As a City & Guilds Accredited cycle mechanic I'm looking forwad to seeing your book and to learn something new. As someone who knows that it's sometimes difficult to cook up a few paragraphs for a humble blog the thought of sitting down and writing a whole book is a truly scary prospect. Congratulations on your efforts here; if the book is half as good as the blog then it's going to be a cracker! Congrats Gerry on the Anniversary and the book publishing...Just wondering if you are gonna be able to squeeze time in for the Hamilton Cruise with your full plate? Hope you are still able to make it and if not we will see you in Montreal once you get a cruise organized out that way. I'm always looking for good, new, QUALITY reading material, and after reading this blog for a time, I'm sure that anything that springs from your keyboard will be just that. Thanks Cass, the book is being proof read right now and I'm in the process of photoshoping the images. Hang on guys, it's coming real soon.